If the average person accidentally cut their own finger, the worst that could happen to them would be to loose a few drop's of blood. Having said that, though, if one of the characters featured in the following story accidentally cut their own finger, blood gushes' out by the gallon! It's October, 2017, and it's time for another super fast tale created by Joshua Williamson, Neil Googe, Gus Vasquez, Christian Duce, and published by DC Comics. TO QUOTE Maya Angelou: 'If you don't like something, change it. If you can't change it, change your attitude'. Last month it was finally revealed that the person steeling blood from the crime lab was none other than the coroner himself, Doctor Ramsey Rosso. His reasons for doing this was because he needed these samples so he could cure himself of a very rare blood condition, named Hemophilia, but in doing so, ended up transforming himself into Bloodwork, a ferocious villain who has the ability to manipulate and control blood. 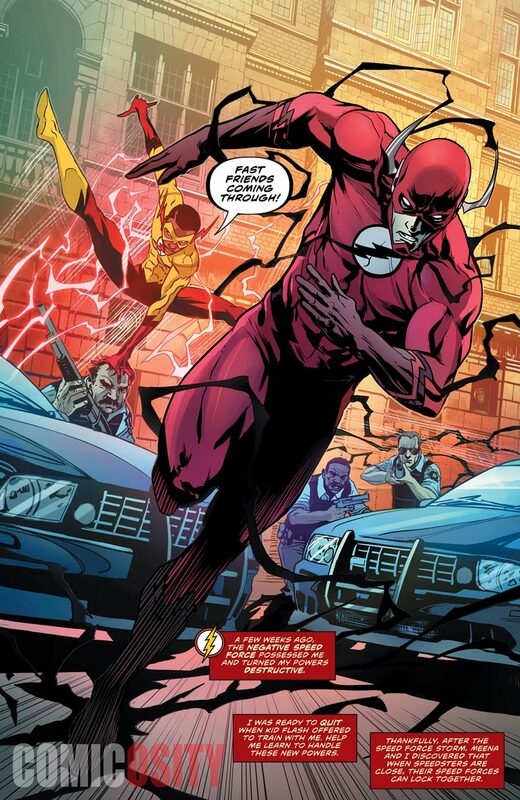 Don't worry, though, because as soon as the Flash figures this out he manages to stop him from going on a mad rampage throughout Central City. Well, he kind of stops him, after a fashion, but only once he gets some additional help from Kristen Kramer, his partner from the lab. Unfortunately Barry's adventure doesn't end there, because soon afterwards he has to deal with two other problems slightly closer to home. This begins with him being informed by Director Singh that he's going to be transferred out of the department due to his lacklustre performance with the Ramsey case. According to Singh, Barry's transfer has been done with the best of intentions, as he thinks working at Iron Heights Penitentiary would definitely take his mind off things. Besides, spending some time with Warden Wolfe, his hi-tech guards, Kristen, and the inmates, might help him come to terms with his new powers as well as his relationship status with Wally and Iris. Funnily enough, this brings us quite nicely onto the second problem Barry has to deal with, namely, how he tries to curb his powers by using a method he discovered while working with Doctor Meena Dhawan. You see, a few months ago, Barry realized that a good way of suppressing the negative speed force is by working with someone who’s connected with its more positive counterpart. 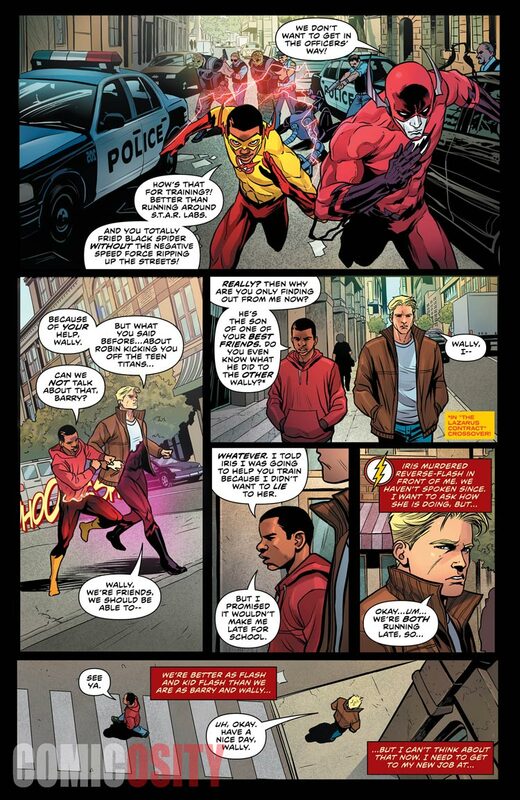 Someone like Wally West for instance, Iris’s nephew, because he’s always more than willing to aide Barry in using his powers in a manner in which he’s more familiar with. This can be seen on the same day Barry starts his new job, as both he and Wally work together to take down Black Spider and his gang from robbing a jewelry store. What? You didn’t know that Black Spider has turned up in Central City? Well, between you and me, behind-the-scenes a criminal mastermind is manipulating criminals and there's only one person who knows what’s really going on. It's Copperhead, the mob boss, who has a passion for snakes as well as many other breeds of reptile. 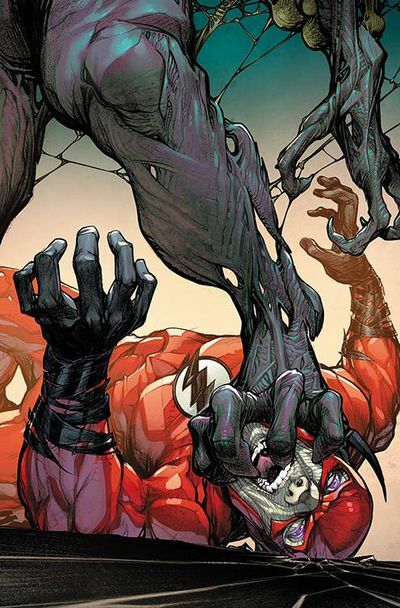 If you want to know what else is going on you best pick up issues 31 and 32 of The Flash today. But before you do that, in the meantime you might like to check out the following four reasons as to why I think these two issues are a real solid read. Reason One) SNEAKY SPEEDSTER: Now without giving too much away, halfway through issue 31, Barry manages to take down Bloodwork in a manner that’s very-very sneaky. Essentially he makes a close personal connection with him before taking him down by surprise, Ka-Pow! Not that this is a bad thing, mind you, but from my point of view is this the sort of thing Barry would normally do? Overall I'd say Barry is the type of hero who'd shy away from committing this brand of underhand manoeuvre in order to vanquish a known enemy. He's never done such a thing before, has he? So I don’t see why he should start now. Generally he would slap his foes into submission rather than perform this variety of psychological gambit. Having said that, though, I'm not entirely against seeing him doing something like this, particularly when his actions come across as both kind and righteous without seeming too judgmental! After all, his powers are different now, in temperament at least, and it is nice to see a hero doing something outside of their comfort zone. I also liked the way Joshua's script made me believe what Barry was saying during this sequence! With hand on heart, I honestly believed his rhetoric because it came across as sincere, real, and very down to earth, especially in that section where Barry admitted to being a liar as well as a self-centered diva, as he highlighted these traits in such a way that Bloodwork could empathize with his emotions and how they were able to control him. Good stuff. Reason Two) CON OR CONSERVATIVE: Now in stark contrast to this, Barry made an equally shocking statement halfway through issue 32. On the whole the basic thrust of this narrative involved Warden Wolfe introducing Barry and Kristen to their new jobs in Iron Height Penitentiary. With a name like Wolfe, obviously most of his rhetoric was firmly focused on how a prison should discipline their inmates while showing his two new staff members around the place. But then, nearing the end of his tour, Barry surprisingly agreed with some of his hard-lined statements, which, to me, as well as Kristen, was a pretty tough sale, and I say this because I thought Barry was a Liberal person and not a Conservative one. In fact, I was so surprised; I have a sneaking suspicion that there’s more going on here than meets the eye. Maybe Barry agreed with him just so he could keep him on side? 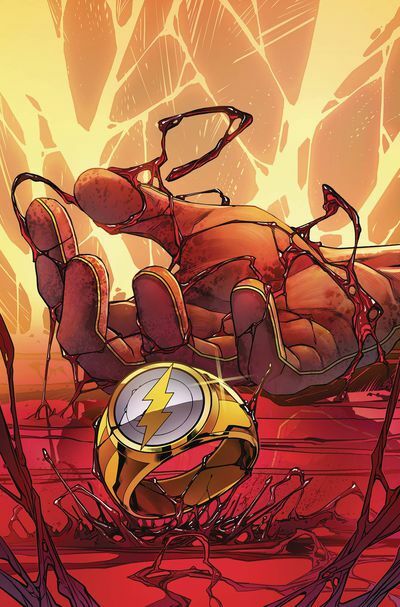 Or then again, maybe this was the negative speed force leaking out through his personality? Either way, this was a fairly shocking moment, and I hope it gets resolved in an equally memorable fashion. Something else I’d like to mention about this sequence would have to be the sequence itself. Even though the fight scene depicted between August and Rory felt fairly staged on the page, obligatory even, that’s not to say that I didn’t find it a very enjoyable read. This section was basically dedicated to setting up Barry’s new role in Iron Heights Penitentiary as well as his new surroundings and work colleagues. From the looks of it, Warden Wolfe is a pretty no nonsense character, and I’m sure there will be many arguments between him and his opposing half, Kristen Kramer. Kristen, on the other hand, has already been properly established in this series, more than Wolfe, anyway, yet I’m pretty sure her personality will be fleshed out even more during the time she’ll spend with Barry and the gang. As for the prison itself, well, so far, so good. By page six its history was set in stone, and by page eleven so too have any up and coming conflicts between Barry and whoever-takes-his-fancy (presumably August is on the list and so are the Rogues). That said, however, in what order these conflicts will take place and what they will actually involve, hey, that’s anyone’s guess! Although I have a sneaking suspicion that August and Barry may actually get along without them really knowing it, wink-wink! Reason Three: PARTNER IN GRIME: While I’m on the subject of two people getting along, how come it’s taking so long for Barry to finally resolve things with Iris? I know that other plot points need to be clearly established, and I know that he’s trying to build bridges with Wally first, but come on, what’s keeping him from confronting her and getting stuff off of his chest? Is he upset with her for killing Thawne? Does he think less of himself because he couldn’t do it? And if so, why so? Thawne was a mass-murdering b*stard and deserved everything he got, and I say this knowing that all life is precious and the taking of it shouldn’t be taken lightly. Along similar lines I also hope Barry can mend his strained relationship with Wally West. From what we’ve seen so far, Wally appears to be a really nice kid and I love how his character has progressed over the last year or so. When he was first introduced it was pretty obvious that no one really knew what to do with him, keeping in mind that most of us die-hard fans were missing the original Wally. Now though, I’m happy we have two Wally’s, Wally Red and Wally Brown, and I prey that both of them grow more and more popular over the up and coming years. Reason Four) SILVER AGE STYLE: Is it just me, or is Joshua Williamson giving this series a real silver age vibe? Recently I've noticed that some of his stories have a charm and a flair similar to those published during the 1950s and 60s. It's as though each plot was developed so they could be easily followed and even easier to understand (i.e. bad guy does something wrong so good guy takes him down). Yet, within this framework, Joshua is able to add a modern twist to his adventures which allows him to explore things that have never been explored in a Flash comic book before, such as Barry's new powers and new dynamic within the force. Structurally his stories are also very modern, despite still sticking to his old school roots. Take issue 31 for instance. All in all this was a transitional comic book which started by concluding the previous adventure, before continuing with another one that would then play out in issue 32. This tale also redefined the new status quo within Barry's working arrangements, specifically, leaving his old job and starting a new one at Iron Heights Penitentiary. How long this will last and will it be a positive step forward? All I can say to that is time will tell. Within the same breath, however, I'm sure in either scenario a good story will be eventually told. In closing I would just like to congratulate Neil Googe, Gus Vasquez, and Christian Duce, for providing some really great looking artwork for both of these issues. Neil and Gus illustrated issue 31, and both of them worked so well together that I hardly noticed the transition between the two. 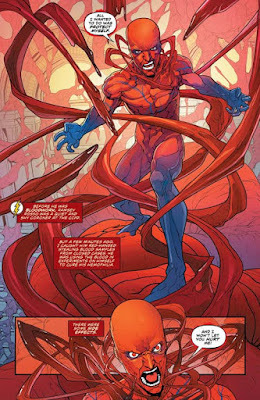 Neil's portion of the plot involved him drawing a fluid fight scene between the Flash and Bloodwork, whereas Gus' portion involved him drawing those sequences that happened after the fight was concluded. In each case, both men added their own unique flair to the mix, while unifying their artwork with a cartoonish style and vibe. Christian did a similar thing when he drew issue 32, although in this instance I loved the way he managed to overemphasize people’s facial expressions and body postures, just to put across what they were feeling inside. Great job. The one thing both of these issues have in common has to do with their association with blood. Issue 31 was about Bloodwork wanting to steel and control blood, whereas issue 32 was about the bad blood brewing inside prison. So, with that in mind, how could I not musically match up these two episodes with the Taylor Swift song, 'Bad Blood'? After some careful deliberation I’ve finally decided to compare these two comic books to a hamster cage. 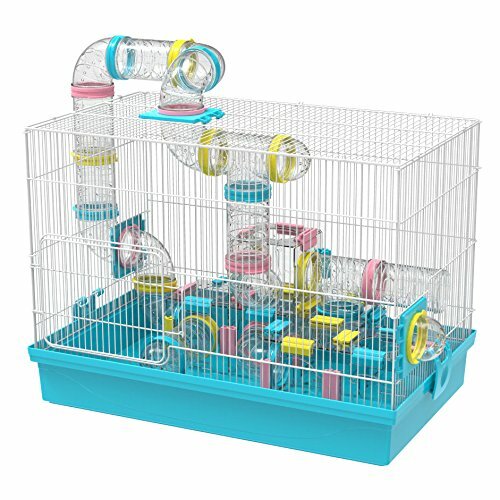 After all, this style of cage was developed to protect the animals inside it as well as those people who are looking after them. It makes sense, I’m sure you’ll agree, particularly when you realize that both of these episodes were about caring for people and locking them up. Jay Garrick: The original golden age Flash. Max Mercury: One time mentor to Bart Allen, aka Impulse, the grandson of Barry from a future parallel universe. Bart Allen: See previous entry for more details. Meena Dhawan: She was a Doctor who ended up dead after a battle with Godspeed. Wally West: No. Not the black one, the white one. The other Wally West: No. Not the white one, the black one. 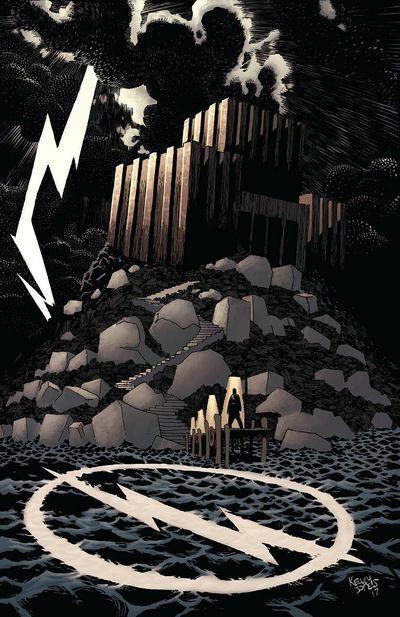 Johnny Quick: Another golden age speedster, yet this time his powers are accessed via a cosmic mantra. Jesse Quick: She is the daughter of Johnny and Liberty Belle.